Since the sun is out and the leaves are fully formed, green is all around and it indeed feels like summer, we can harness that energy and let it fill our bodies and spirits with strength, calmness and a feeling of rootedness. Just like a tree. 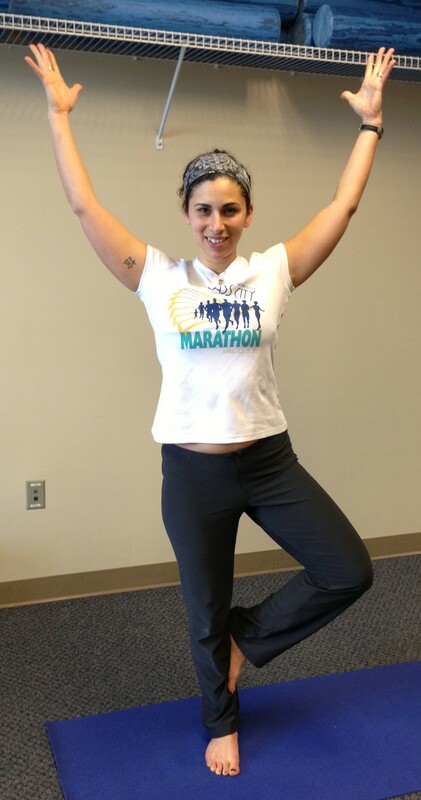 Tree pose, vrksasana, is fantastic at testing not only our balance but a feeling of lightness and fluidity. Like a tree, your body can move with the flow of the breeze but be strong enough to withstand it. Vrksasana helps us focus on our center while we grow taller and more secure in our bodies and calm in our minds. From Mountain Pose, transfer weight onto the left side and bring the right foot to the left ankle, shin or above the knee—anywhere but the knee to avoid putting undue pressure on that joint. Bring the hands into heart center. Draw the right knee back so the hip begins to open. Now begin to grow taller. Lift out of the left hip and lengthen the spine. Imagine a string pulling the crown of your head to the sky. When you feel stable, lift your arms over head, extending through your fingertips to grow even taller. Slide the shoulders down the back, away from the ears. Fix your gaze softly on an immobile point. Focus on the breath and find the stillness, calmness and lightness of tree pose. Hold for up to one minute and then repeat on the other side. Wobbly and falling out of pose. Getting the hang of standing on one leg can be daunting. The first thing to overcome is fear of falling. Trust in yourself that you will stand upright and hold the pose. You may even choose to stand near a wall or counter top to use as a prop. You might even stand with the lifted foot on the ankle at first, the toes touching the ground and the heel on the ankle. The toes will serve as more support. Once the legs are set up, draw the abdominals in and up and feel the spine lengthen. Use the core strength to support your body and feel the spine lengthen. Relax the breath. Lifted foot on the side of the knee. It is very important in order to protect the knee join to keep the lifted foot above or below the knee. Depending on your level of flexibility, you will want to experiment with the height of the lifted foot. Standing hip juts out. It is very easy to fall into a comfortable, poor posture, even while practicing yoga when we are focusing on improving and becoming aware of our posture. From the moment you transfer weight onto the standing leg and lift the other foot to the standing leg, feel the hip lift up. Get the feeling of sinking into the hip, then lifting out of it to feel the difference. Maybe even practice in front of a mirror to visually see the difference in hip placement. When the hip is lifted, you will feel stronger and taller, and you will be in better alignment. Posted in Benefits of Yoga, Pose Breakdown. Bookmark the permalink.